BlackBerry To Slash Workforce Amid $1 Billion Loss : The Two-Way The company plans to cut 40 percent, or 4,500 workers, as it continues to reel from a dramatic loss of market share to smartphone makers such as Apple. 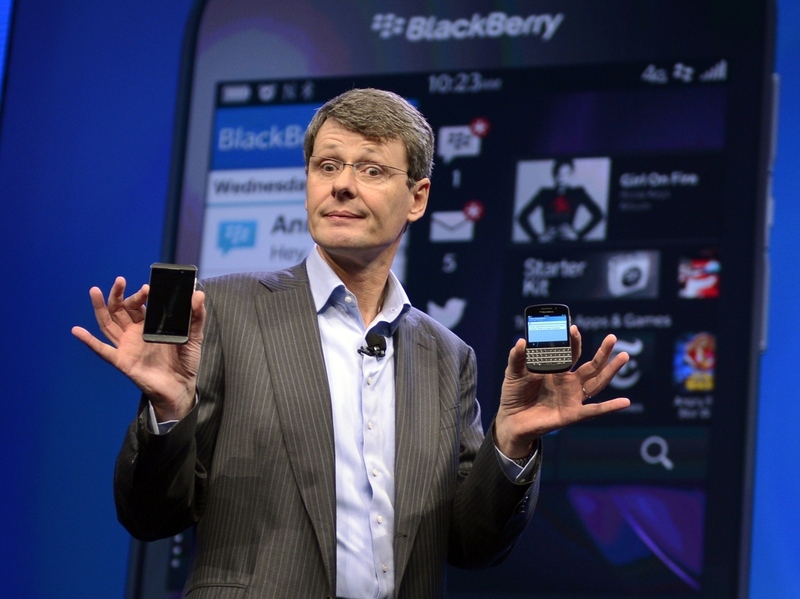 BlackBerry CEO Thorsten Heins officially unveils the Z10 smartphone in January. BlackBerry on Friday issued an early earnings report accompanied by some bad news for its workers — a nearly $1 billion quarterly loss and a 40 percent layoff that amounts to about 4,500 employees. "The stock dropped 19 percent to $8.50 after reopening for trading. Shares had been halted pending the news. "BlackBerry had been scheduled to release earnings next week. But the Canadian company said late Friday afternoon it expects a loss of about $950 million to $995 million for the quarter, including a massive inventory charge due to increasing market competition. NPR's Steve Henn reports that BlackBerry's news comes on the same day that Apple releases the new iPhone 5S to the market. BlackBerry said it has sold 3.7 million smartphones in the past three months. "That may sound like a lot, but there is a good chance that Apple [will sell] more phones in the next 24 hours," Henn says. The fortunes of BlackBerry, formerly known as Research in Motion, or RIM, have been quickly reversed even in the fast-changing tech industry. Sales for the once-ubiquitous BlackBerry smartphones peaked in 2010 and have been on a precipitous decline since then as competition from Apple's iPhone and Android-based phones has cut deeply into the company's bottom line. As we reported last month, the company is looking for a buyer. In 2008, it was valued at $80 billion, but today its worth is estimated at closer to $5 billion.